Buying a franchise is a real trip. Really good writing survives a very long time. Lies move quickly but truth lasts. Lies do not become true over time, no matter how many times they are repeated by shills. 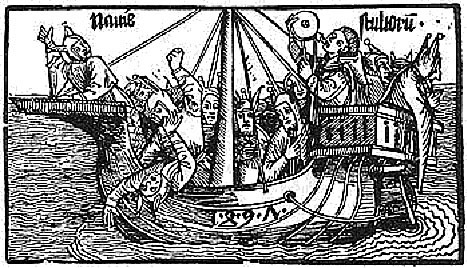 In 1494, a German theologian and lawyer wrote a best seller called Das Narrenschiff (Latin = Stultifera Navis, English = Ship of Fools). For profit and salutary instruction, admonition and pursuit of wisdom, reason and good manners: Also for contempt and punishment of folly, blindness, error, and stupidity of all stations and kinds of men. It is a classic piece of literature that was instantly popular and still speaks of mans universal tendency to act foolishly (ie. to set sail on a journey of self-delusion). Note the hat symbolism: the donkey ears. Brant used satire to point out the abuses of power he saw in the state and the Roman Catholic Church. He did that to keep his head attached to his neck. I chose the fool theme here at FranchiseFool and on WikiFranchise.org (thousands of case studies) to draw attention to the hypocrisy and dangers within modern franchising without being sued for the 3rd time. My message is ultra-serious but I need to teach in an indirect manner. Any legitimate industry or authority should be able to handle satire from one person. Historically, another role of a is to speak truth to authority. Franchise “leaders” cannot tolerate my persistence that mom-and-pop franchising is the height of folly: It’s Unsafe at any Speed because the franchisor can strip value (exercise unilateral opportunism) while you have little or no defence to protect your sunk costs. …that is a best indication you’re dealing with a 100% genuine jackass travel agent.